The island, where Walsh has lived for two decades, was among the hardest-hit. Nine out of 10 buildings lost a roof. The World Bank estimated the total damage at $1.3 billion, or 224 percent of the nation’s gross domestic product. Remarkably, though, less than a year later, there’s optimism in the air. In one of the Caribbean’s most ambitious comeback efforts, the tiny country (population: 73,543) is making a bid to be the world’s first climate-resilient nation. Enter the Climate Resilient Execution Agency for Dominica (Cread), conceived shortly after the storm by government officials, including Baron, as a task force to hurricane-proof the entire island. The government expects to appoint a chief executive and leadership team to the agency as soon as it gets parliamentary approval, likely in July. Cread’s first mission will be to determine best practices across every sector—roads, building codes, energy grids, water management—before enforcing them islandwide. The government has already been collaborating with international organizations to establish some parameters ahead of Cread’s inauguration. Any roofs that are being rebuilt with aid from the government or major nonprofit groups are being reengineered according to United Nations Development Programme standards. The UNDP guidelines call for steeper roof angles to better withstand wind, for example, and for the use of screws rather than nails to strengthen frames. Building codes are being rewritten with the help of the Canadian government and the U.K.’s Department for International Development, as well. And the Dominica government is taking the first steps of burying utility cables, elevating bridges, and shifting to solar from generator power—all projects that Cread will see through to completion. If Dominica is successful, it will eventually be able to rebound from a Category 5 storm in a matter of weeks, not months or years. 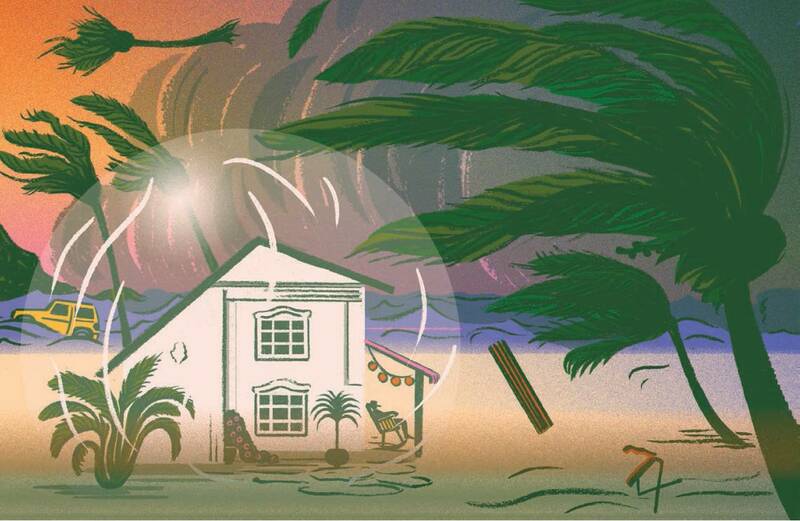 Climate resiliency is more urgent in the Caribbean than almost anywhere else in the world. Situated in the middle of the hurricane belt, it’s especially vulnerable to the rising sea temperatures that have spurred an increase in major storms. A white paper by the Nature Conservancy notes that the region “often contributes the least to climate change yet suffers from its impacts the most.” In their efforts to safeguard themselves, Dominica and other nearby developing small island states face three big hurdles: parliaments that move slowly, crippled economies, and difficulty securing international lending. To help with the last point, there’s the Caribbean Community (Caricom), a pan-regional agency that’s lobbying global groups for help with resilient rebuilding. As these broader political initiatives lurch forward at their own pace, grass-roots efforts have already begun on the local level. (Hurricane season begins on June 1; many islands risk getting socked again while they’re only halfway up from the ground.) The tourism industry, which has a business interest in acting fast, is leading the charge. In Dominica, that includes people such as Walsh and Daniel Langlois, a budding hotelier with a project in development in the village of Soufrière. Together they’re spearheading Resilient Dominica, or RezDM, a branch of Langlois’s foundation, which has been supporting science and technology research on the island since 1997. RezDM has several projects under way—each focused on present and future needs. One is a pilot program at the primary school in Soufrière that will not only provide food for lunches but will also create stockpiled reserves in case another storm temporarily cuts off the island. There’s a tool-lending program, as well, which offers no-cost assistance for rebuilding, and a centralized depot for vehicles that can clear roads and debris if needed. And the solar panels RezDM is installing on one-tenth of the island’s homes will be removable, so they don’t become storm hazards or get damaged. Despite Dominica’s ambitions, the first climate-resilient island may actually be 200 miles away in the French West Indies. “St. Barts was as hurricane-proof as any island could be,” says Nils Dufau, president of Tourisme de St. Barts. Because of the island’s wealth, strict building codes, and smart preventive strategies, St. Barts came through the storms relatively unscathed. (The main cause of damage—and lingering hotel closures—was flooding.) “Our electric grid was already three-quarters underground, and now we’re accelerating the rest,” Dufau says. “It means most of the island didn’t lose power—and for those who did, it wasn’t for long.” St. Barts is now testing marine barriers, watertight doorways, and “wash-through channels” that protect building foundations, all to ease flood damage from storms. Ironically, the islands that were spared this time around may be slower to achieve resilient status. “Countries that were not as badly hit will incorporate best practices in their new buildings,” Dominica’s Baron says, “but nobody is going to remove a roof that stayed on to make it stronger.” Because of its widespread devastation, Dominica will take longer to rebuild, but its resiliency efforts should be more thorough. Other islands are prioritizing similar efforts, which previously may have been delayed because of cost. The government of the British Virgin Islands is running water and electricity underground on Tortola. The owners of Guana Island, a secluded resort, are doing the same on their own dime. Oil Nut Bay, a hotel on Virgin Gorda, is encouraging locals to invest in AstroGuard, a type of clip-on fabric window shutter that’s virtually indestructible and affordable to install. In Jamaica, proponents of the cruise industry have commissioned an eco-sensitive flexible jetty to be built near Kingston in early 2019. In good times it will allow more cruise ships to call, but in bad times, it can be strategically repositioned to receive emergency supplies. And in Puerto Rico, hotels such as the Condado Vanderbilt are collaborating with local nonprofits to grow artificial coral reefs that will protect the shoreline in a future storm. Rebuilding coral reefs must be a top priority—at least as important as structurally improved roofs—says Luis Solórzano, executive director of the Caribbean division of the Nature Conservancy, which is leading a four-year climate-resiliency effort across the region. “The solutions can’t just be about concrete and iron,” he says. Aerial damage surveys have shown that reefs and mangrove forests can absorb an astonishing 98 percent of a wave’s energy in a storm. Accordingly, local groups are exploring processes such as lab-based coral germination and micro-fragmentation, which let conservationists grow tens of thousands of coral pieces per month and graft them onto struggling reefs. Replanting trees along riversides and in forests, however, is the simplest answer: They prevent erosion, which destabilizes coral. The more coral that survives, the less damage there will be on the coast in the event of another storm. “We have to give nature an opportunity to provide us with resilience. It makes a visible impact,” Solórzano says.